Poop Bucket With A Mission - read full article We are all well aware of the various sanitation issues that developing countries are facing, the biggest one being poop management. It’s easy for the kids (and in some cases adults) to take to the open fields and roadsides, without realizing the implication of health hazards like disease outbreaks and food contamination. One of the solutions addressing this issue is the Poosh. 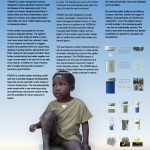 This is a bucket-mounted toilet for the developing world.